Rock drilling is one of the most essential operations in mining and allied industries. This study focuses on the quantification of physico-mechanical rock properties using dominant frequencies from the sound signal generated through diamond core drilling operations. The rock drilling experiments were performed on five different types of rock samples using a computer numerical control drilling machine. Using simple linear regression analysis, satisfactory mathematical equations were developed between various physico-mechanical rock properties, namely, uniaxial compressive strength, Brazilian tensile strength, density and dominant frequencies of sound level were generated during diamond core drilling operations. The developed models can be utilised for quantification of rock properties with an acceptable degree of accuracy in realistic applications. 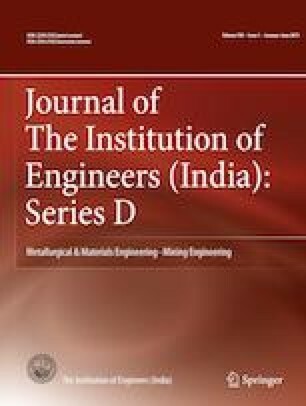 The authors would like to sincerely covey their gratitude to the reviewers for their comments and suggestions towards the improvement in this manuscript and acknowledge the centre system design (CSD) NITK Surathkal for providing Data Acquisition System (DAQ) for this research work.